Anne Engebretson the Coats for Kids project in 2000. 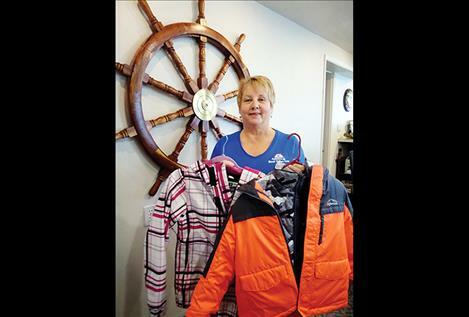 POLSON — It’s a wonderful experience to see the smile on a kid’s face after receiving a coat. Anne Engebretson said she has seen many a face light up as a result of her winter coat project: Coats for Kids. “Some have never had a coat, and they’re just smiling,” she said. Parents and grandparents as well are just as thrilled, she added. Engebretson started the program in 2000 based on one that she participated in back in the 1980s in Missoula that was run by the Jaycees. The Port Polson Inn where she works is the dropoff and pickup point for the program. She recommends that a child come and try on a coat to make sure it fits properly. She has plenty of adult coats already, but emphasized that children’s coats are needed. She will wash the coats if necessary but asks that they be in good condition with no holes and have functioning zippers and fasteners, for example. The quality of the coats received has gone up over the years, and for that she is thankful. The program distributes about 150 coats per year. Coats can be dropped off or picked up between the hours of 8 a.m. and 8 p.m. Monday through Friday at 49825 U.S. Highway 93.